Custom Device Models and SPICE import! 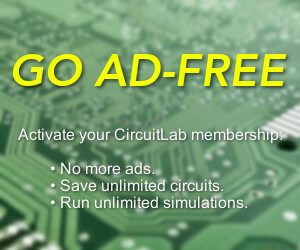 Up until now CircuitLab has had only a limited number of device models in its component library. While you all love our interface and simulations features, our #1 most requested feature has been a more extensive library of components. Today we are releasing the ability for you to save your own device models, and reuse those models later in your other designs. We have also added the ability to import certain SPICE models for BJTs, MOSFETs, and Diodes directly into CircuitLab, and you can save those models to your personal library for reuse later. Just do not stock anything useful, leaving you scrabbling for model values for OP amps. Hi, I think this software has a huge amount of promise, but without more ICs - specifically analog ICs such as the LM13700 - I can't completely simulate the circuits I need. Would be amazing to see more components available as standard. I'm aware I could import custom models, but as an amateur, I'm not sure that my own models would be correct. Plus, ICs such as the LM13700 are probably impossible to create by tweaking parameters on other components? Hi, I know circuitlab for a few months and now I decided to pay for it. It is a pity that we cannot create a symbol and connect the PSICE model to it. This is a basic feature to emulate circuits. For example: I am looking for PC817 opto, but I can make the circuit work with the current opto model found at CircuitLab. Please add this IC PSICE import feature ASAP, its pretty similar to other devices like BJT and MOSFET.